A Roadmap to Green Supply Chains Sale! Only one available at this price. 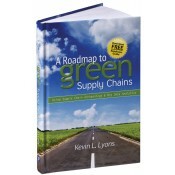 This book shows the relationship between the sustainability movement and supply chains. It provides a guide for supply chain professionals, as well as government officials, corporate executives, and institutional leaders on how to direct their purchasing power so that they source products that not only fill the needs of their organizations, but that also contribute to the health and well-being of the planet. The author, Dr. Kevin Lyons, Ph.D., combined his experiences as the Chief Procurement Officer at Rutgers University with his own unique supply chain archaeology. His archaeological research involved sifting through garbage dumps where he examined the discarded products he procured for the university. Working backwards, he developed systems and techniques for making sure sustainable products entered the supply chain from the start. And once they no longer served their intended purpose, they were recycled or reused. Complimentary Readiness Guide (Calculators and other useful materials) are available for download from the book’s website. Case studies that show how corporations and governments have gone green. Using weather data to plan for disruptions in the supply chain. How Climate Change and Supply Chains Impact Consumers—Related Projects. Dr. Kevin Lyons is a professor at the Rutgers Business School in the Supply Chain Management and Marketing Sciences Department and a Research Professor, Supply Chain Archeology at the Rutgers Center for Supply Chain Management. His research includes the integration of sustainable development criteria into global Supply Chain Management systems, processes and operations. Dr. Lyons developed the Supply Chain Environmental Archeology research program/lab, which involves the archeological study of climate change and environmental impacts via the supply chain, big data analytics, risk assessment, decision analysis as well as product end-of-life and new product innovation research. He conducts research with Rutgers EcoComplex, the Rutgers Energy Institute and the Rutgers Thomas A Edison Research Papers. He is the principal investigator for the Newark (NJ) Industrial Solution Center research project. Dr. Lyons is an Air Force veteran and spent most of his career in procurement and was the Chief Procurement Officer at Rutgers University until 2011. Notify me of updates to A Roadmap to Green Supply Chains Sale!